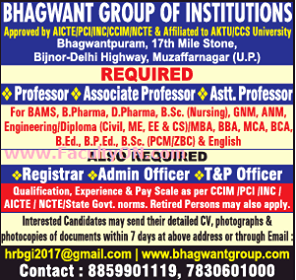 Bhagwant Group of Institutions, Muzaffarnagar has advertised in THE TIMES OF INDIA newspaper for the recruitment of Professor/Associate Professor/Assistant Professor jobs vacancies. Interested and eligible job aspirants are requested to apply with in 7 days. Check out further more details below. About College: Bhagwant Institute of Technology (B. I. T.), Bhagwantpuram is the brainwave of the NRI’s and Engineers with a total commitment to quality and excellence in academic pursuits. These professionals established Bhagwant Institute of Technology an institute as a center of Technical Education to meet all the forthcoming requirements. The Bhagwant Education Development Society is a non-profit making philanthropic organization. The Institute is self-financing, residential and co-educational institution for Indian and NRI students. In a short span of its establishment the Bhagwant Institute of Technology has undoubtedly carved a unique place by adopting very progressive national and international policies and is tending to become a deemed university in near future. Moreover the institute is among few of the ISO 9001:2000 certified Institutes in India.